Produktinformationen "OL' SKOOL RODZ Issue 84"
Ol' Skool Rodz #84 it's a great one, if we do say so ourselves! 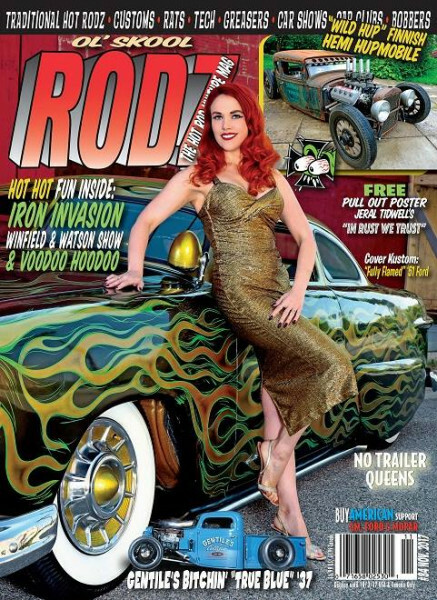 On the cover, you can't help but notice beautiful Ginger Watson with Travis Grubb's wildly flamed '51 Ford. Inside, there's more of the Ford (and Ginger), along with the wild Hemi-powered Hupmobile in the upper right of the cover, and lots of other sweet rides as well. Events featured include the always fun Iron Invasion, the Winfield & Watson show, and the Pumpkin Run. Weiterführende Links zu "OL' SKOOL RODZ Issue 84"
Kundenbewertungen für "OL' SKOOL RODZ Issue 84"